But in the end, I have avoided tabloid excess. The weekend had started on Friday afternoon when John picked me up from The Plough. In the light of the terrible weather forecast on the Thursday evening, and uncertainty over the traffic on the M6 & M5 on a Friday evening, we’d agreed to depart at 4 p.m., as this gave me a good excuse to bunk off early. John was a few minutes late, and it transpired that he’d been to the physiotherapist over his “chess injury.” He damaged his knee at Scarborough – he assures me it wasn’t as a result of his jumping up & down in excitement at his excellent finish there. In fact neither the traffic nor the weather was too bad, and as we were making good progress, and despite having a SAT-NAG in the car, John diverted up the M42 to Birmingham Airport. I fully expected him to get his anorak, flask and binoculars out of the boot and do an hour’s aircraft spotting. He didn’t & assured me it was a navigational error, and we backtracked back to the M6. As we approached the M6/M5 junction the traffic became steadily worse, and as a result of being in the wrong lane we went off the motorway into downtown Birmingham, and specifically Lozells. Can’t say I’ve ever been there, and even in the dark, I didn’t feel that I was in a hurry to return. Having driven past the Hawthorns, we found the venue & parked up. We oriented ourselves and found the bar. John had a coffee, but I felt in need of some Dutch courage and had a beer. We then wandered down to the venue, and met some familiar faces. Sean wasn’t controlling the tournament, so as he wanted to keep a proprietorial eye on proceedings, he taken the opportunity to enter. We had a chat, and he confirmed that he planned to run the Hinckley Congress again over the August Bank Holiday weekend, so start banking those smartie points. It was also good to see Rajan again, who was playing in the Open, and meet his brother Sajan, who was in the Minor. We said ‘Hi’ to GM Mark Hebden, and then a group of Arkells appeared (not too sure what the collective noun is for them – an Assemblage? A Pawn Storm?) Keith was the other GM who was playing, and there was his brother Nick, who hadn’t played for a considerable number of years, but was also in the Open. There were also two junior Arkells, who were in the Minor. The younger was 8, and had been playing for about three months. John played Steve Jukes, and got a creditable draw. As mentioned previously, games could last a while, and when we left after 11 p.m., there was still one game going on. The promised bad weather had arrived, and it was absolutely hosing it down. We hit the M5, and got to the M6, where we went the wrong way, up towards the North-West. Her in the SAT-NAG got suitably exercised, and the error of our ways became evident. We backtracked down the M6 back towards Birmingham. It was an extremely foul night, and the visibility, due to the spray, was pretty well non-existent. Nonetheless we got back to Leicestershire O.K., and John ignored the siren call of Birmingham Airport. On the M69 the rain became more wintry and sleety. By the time John dropped me off it was early on Saturday. Sleep was in short supply, as John was picking me up at 8-15 a.m. and I didn’t get to bed till 1-30 a.m. Nonetheless, I was up and raring to go at the appointed hour. John rang me to say he was going to be a bit delayed, as there was black ice en-route from his house to pick me up. (He still arrived much sooner than when Biggg Boss Ross picks me up and thinks he is on time.) The traffic and weather were both much more clement than the evening before. We made good progress, but rather than going via the M5, John ignored Mrs SAT-NAG and went through Lozells again. I have to say that it didn’t look any better in daylight than it had the night before – on reflection, it looked worse. I was drawn against Alan Fraser, whom I’d previously played at the Atkins in the last round. He wasn’t the most cheerful and talkative opponent I’ve ever had, although he definitely cheered up after he trapped & took my Knight for a Pawn on Move 14. I hung around past the 2 hours 20 minutes mark, but with about 45 minutes left on my clock I gave up the unequal struggle and resigned after 45 moves. The Grinder was up against Brendan O’Gorman, and he fought hard & long, but to no avail. The Saturday lunchtime was a nervous one, as both John and I had opponents who could prove to be a banana skin. John had been paired with Imogen Camp, a very handy U11 international and holder of an age-group title. Although like John she had lost in Round 2, in Round 1 she’d picked up a half point against an opponent rated about 160. I was about to cross swords against 8 year-old Daniel Arkell. Sean strolled over to say that the new ECF grades were live, and we checked them using John’s smartphone. I was down 12 points, to 83. If I continue to drop points at this rate I’ll get down to 0 in the August 2016 list. (There was, however, good news in that my Rapidplay Grade reached three figures for the first time.) John had, unsurprisingly, had improved his grade a reasonable amount. I played Daniel and won with Black, much to my relief. At one point, he tried something that didn’t quite work, but was nearly very good. This is the position after 17. b5 a6xb5. He was planning a deflection sacrifice by 18. Nxb5, with the threat of 19. Qxd5+ and then 20. Qxa8. Unfortunately, this plan failed due to the mating threat following Qb6 and the loss of the Knight. Daniel resigned on Move 29 after about an hour. John also won his game. Following the first two rounds in the Open, the two GMs, Messrs Hebden & Arkell, were drawn together. They had a very long, and interesting game, including a fascinating Rook & Pawn endgame, which ended in a draw, although not of the “Grandmaster” type, as it was about four & a half hours long. We got back to Leicestershire about half past eight, and had an early night. The following morning Coach Manger picked me up the same time as on the previous day and on the way gave me a serious pep talk about not being overly aggressive. On arrival we saw Mark Hebden outside the hotel entrance and he passed comment we were smiling too much for chess players. John responded to say that he was happy that he’d had more sleep than the previous night. I didn’t say that I was happy because we hadn’t, for a change, gone to Lozells. In Round 4 I was matched against Colin Vernon, and despite Coach Manger’s urgings, I attacked as I was playing White. I missed a tactic from my opponent, and went a pawn down. Fortunately, it was a wing pawn, and we ended up in a pawn and opposite colour bishop end-game. My opponent tried to offer me his bishop so he could infiltrate my Queen’s side with his King. I refused the bait, and he then offered me a draw, which I took. Afterwards Coach Manger suggested that I should have taken the bait, as my Bishop was worth more than the pawn. I wasn’t sure, and an initial rushed through play of the position, where John was me and I was my opponent, John failed to stop a pawn queening. Further analysis indicates it is possible to win having taken the bait, but it is probably too difficult for Ricketts of little brain and no endgame theory. John had picked up a draw against Tony Shaw. In the fifth and final round I played Andrew Camp, Imogen’s father. Beforehand, he assured me that Imogen got her talent from her mother rather than him. Notwithstanding that, he beat me in resounding fashion, having won the exchange on Move 18. Fritz shows that at Move 17 I made a serious error, in trying to block a Bishop check rather than moving my King. I then went on the attack (joy! ), but it was only a matter of time. Afterwards my opponent said that he had been worried by the ferocity of my onslaught. I am sure he was just being polite. Interestingly, my opponent didn’t get below his initial 90 minutes until move 13, at which point I’d used over 30 minutes of my 90. John was in Grind mode against Daniel Jazdzewski, and their match was the penultimate one to finish in the whole Congress. John couldn’t quite hold out in a Rook & Pawn endgame in circa four hours. Rajan finished with 2.5/5 in the Open. In Round 4 he got a draw with Black against FM David Eggleston, whose rating is 2352. His brother got 3.5 in the Minor. Sean got 3 in the Major, having started with 2/2. An enjoyable weekend in another nice e2e4 venue. My only (very minor) gripe is that the pairing sheets aren't updated with results as the arbiters get the results slips. The January grades are now on display on this website. Just click on the Gradings Tab. 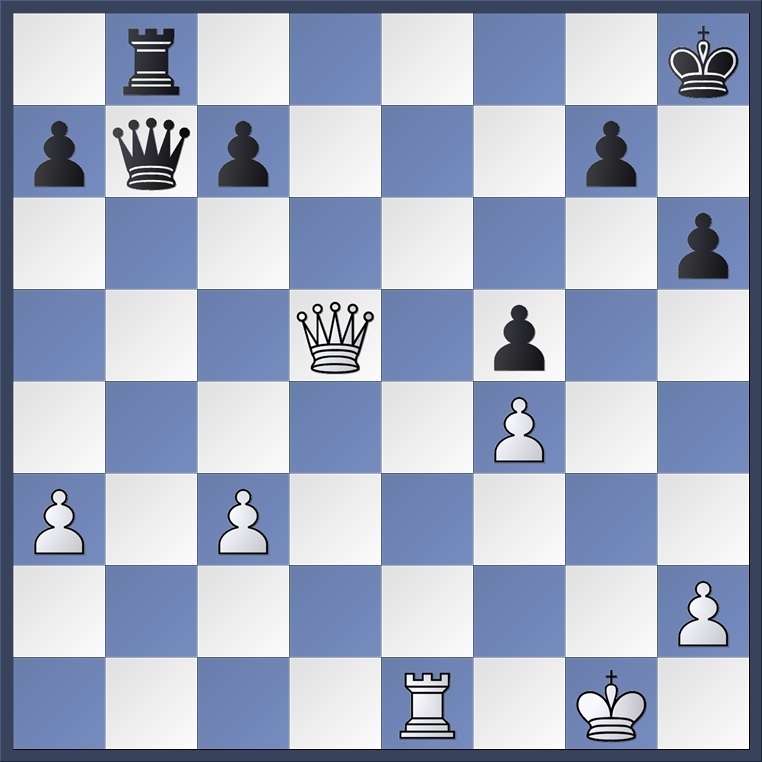 This puzzle, which appeared in the December issue of Chess, was between two Leicestershire players. White to play and win. I did not see much of my teammates games. Graham B, though, was a clear piece up and looked to be heading for an early finish, until his opponent got a pawn onto the seventh, when things started to get more complicated. Graham converted to get the full point. Ray then lost. I narrowly avoided a continuation of my losing streak with an exceptionally jammy win. John then lost. The match result was a 2-2 draw. HA3 Vs Braunstone 5 on Tuesday 29th January. Syston1 Vs HA2 on Tuesday 29th January. Wigston 2 Vs HA1 on Thursday 7th February. There will be a club night this Tuesday 22nd January at the Arms. Lost 3-1, with the Grinder getting the point to avoid us being bagelled. However, no real surprise, as, apart from Board 1, we were fairly outgraded, and Wigston are top of the table. Can't add any words of wisdom for Gordon, as I didn't see any of his game. I suppose I've made starts on two of my 2013 chess resolutions. Make that three as I haven't mentioned Mrs. CENSORED either. MY 2012 AND MY RESOLUTIONS FOR 2013. Played 29 Won 6 Drawn 4 Lost 19. • Not to slash my wrists when I see my January 2013 standard play grade. • To blog on the club website more often than in 2012. • To get my grade up above 90 again (may have to modify this to above 80 if the January grade is as bad as I fear). • To read my book on End Game theory, which is still in the bag in which it was placed by Mr Chess Direct, when I purchased it in 2009. • To improve on my 30% at a weekend tournament. • To avoid mentioning Mrs CENSORED on the blog. Best wishes to everyone for 2013, and please don’t beat me too often or too severely. Sitting proudly at the top of the league, I took my Wigston 5 team to do battle with our friends over at the Heathcote Arms. All of my players had arrived before me - the captain not setting a good example. Double standards sprung to mind as I'd pressed home to them the importance of turning up early. As my players converged to take the michael out of me for being late, I spotted Santa Claus. After thinking to myself whether I'd been a good boy or not, I soon cottoned on to the fact that it wasn't Santa. It was Haka Dave. I immediately decided that I'd been a bad boy for not noticing that the man in the woolly jumper was Haka Dave. His excuse was that he wanted to use his beard to shield his eyes in case I turned up in brilliant white clothing again. Touche! After scrawling down teams and exchanging respectful handshakes, battle commenced. I note here that Raymondov was not playing, his car is probably quite grateful. Charles Eastlake played against The Grinder on board 1, (slightly surprised to see John playing, but I was reminded that this was within the rules, which I knew), nice to see John all the same though. The Grinder managed to get me to dabble in the raffle for the brand new posh chess set, valued at £200. I somehow think I won't win that! Nice to see initiatives like this to generate funds for the chess club. It's only £3. I digress. Board 2 consisted of Haka Dave against the comrade from Bulgaria Nikola Chalashkanov - almost impossible to say when you've had a few. Haka Dave wrote Nikola C on his scoresheet, must remember that for future reference. Board 3 was young Drew Harbidge against Paul Winterton and board 4 was myself against the in-form Gordon Milner. It is worth noting that there was a cat roaming around the bowling alley, quite amusing as it meiowed randomly to break the silence and decided that it wanted to jump on Charles's knee from time to time. It was here that I heard about the legendary Red Admiral butterfly that appeared mysteriously against Red Admiral of all teams. I was trying not to make referrals to myself and any words relating to a cat beginning with p.
First to moan / groan was Gordon on my board, who moved a Knight to defend a pawn, leaving his c3 Knight en prise with check. We opened with a sharp variation of the French, which eventually transposed to an advanced French. That's where the knowledge ends. Moving the same Knight that defended the pawn to block the check, allowed me to win the e5 pawn with check aswell. Our game finished soon after with Gordon moving his Queen in front of his King on a diaganol, with a pawn advance discovering the pin. Gordon resigned. I apologise to Gordon for stopping his good run. Shortly after, Paul and Drew finished. Having looked initially like Drew had a passed a pawn and back rank mating threats, these were all neutralised by the wily Paul Winterton. In the end, Paul had 2 Queens (well, one queen and an upside down rook) on the board and mated on the back rank with the 'lawn mower' mate. Drew looks like he could be a very good player very soon. I should mention at this point that I had pointed out to Drew that he didn't need to write his moves down as he had less than 5 minutes on the clock. He said 'I haven't'. At which point I realised that he might have over an hour left. Whoops. Engage brain before mouth Ben. Nik and Santa, sorry Nik and Haka Dave finished next, a dangerous advanced and passed g pawn was Haka Dave's achilles heel. It had advanced to g3 and there was no way to stop it without saccing material, unfortunately. Haka Dave did try and hang on, but resigned saying that 'Enough was enough'. Finally The Grinder lived up to his name with a monster attack on Charles' King, eventually forcing Charles to resign. A 3-1 victory for Wigston and a very hard fought victory at that. I shook hands with Haka Dave, who fondly described mine and his (ahem) relationship as 'Love - hate, Ben loves me and I hate him'. I think that he doesn't mean that really. I think. References to shark city Arizona were made in light of John and Nik playing, an estimated 110 ahead of a 112 with reference to me putting Nik ahead of Paul Winterton on board order. All slightly tongue in cheek I guess. I now look forward to being a spectator at the Wigston 4 v HA2 match tonight. Great to see you guys as always. Sorry about the late report - i have been finishing an essay. What was meant to be 5000 words on Leadership turned out to be more like 7000 words of gibberish. Drew offered his opponent a draw in an equal position - this was refused and Drew was outplayed in the endgame. Gordon scored another fine win in what is turning out to be an excellent season for him. By their own admission, neither Ray or Neil were playing very well, but Ray won the point. I was outplayed by Peter Page - Fritz had me making no fewer than four double question mark moves (17, 24, 27, and 36). We drew the match! Wigston 4 Vs HA2 on Thursday. I think both sides fielded slightly weakened teams for today's match at East Goscote Church Centre. Leics came out comfortable winners by 12-4. I managed to win my game. A tactical surprise for my opponent eventually led to him being mated in the centre of the board. Good to start the new year like that! I'm told the first team also played against Derbyshire today (in Thurmaston I think). No idea what happened there as yet. A Happy New Year to all. Hope to see you on Tuesday.